I am still amazed at what I saw happen tonight. Goody posted that he was going out to the GSL Marina for what could be his last cold water swim for a while due to his upcoming cancer treatment. Knowing it might be his last time in the water for a while, I knew I had to get out there to swim with him and I think Gords must have thought the same thing. Gordon and Goody before the swim. Goody had mentioned that he wanted to swim two laps and that he would see how he felt. My only goal was to stay in the water for at least 10 minutes. After finding a suit that fit, Goody forgot his, we went down to the boat ramp and got ready to go. 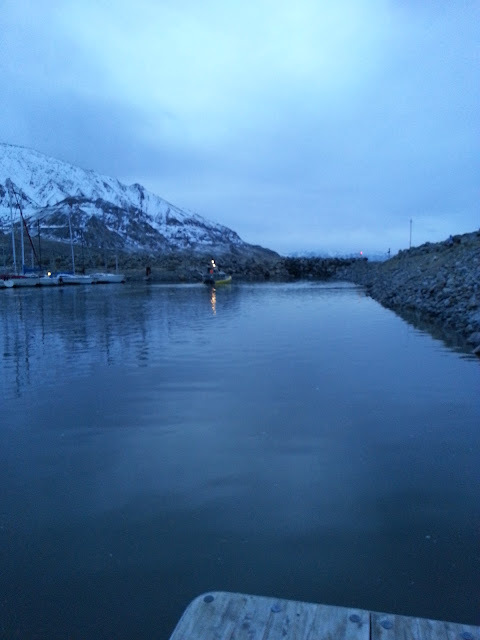 The water temp was reported on the GSL Marina website at 41 degrees and all of our thermometers confirmed it. Gords took off and swam out to the marina entrance and back. Face-in free the whole way with no hesitation at all. I stayed near Goody and did a mix of head-in and head-up free and breaststroke. Goody did head-up free for a while and then switched to head-in free. I swam out to the rocks and saw that Goody was going out further. He went a little way out of the marina and then turned back. We swam back to the boat ramp together. At the ramp, he turned around and headed back out. I followed a ways behind him, not in any hurry. He went out to the same spot just outside the marina and turned back. I swam head-in free and head-up free back to the ramp with him and then got out. Goody stayed in and asked Gordon to walk along the shore to keep an eye on him. He started swimming again and then stopped and said, "forget it". I thought he was done, but I learned later that something clicked in his mind and he decided to go for the ice mile. You can't really see him in this photo, but he is out near the marina entrance on his last (I think) lap. Goody swam two more laps and looked strong the whole way. Gords yelled down to me to start the heater in my car so that we would have somewhere warm for Goody to recover. Gords and I were both yelling and cheering him on. It didn't look like he was struggling at all until he got to the ramp after about 40 minutes and 1 mile of swimming. He had trouble standing up so Gords jumped in and helped him up. We covered him with towels and a jacket before moving him into the car. Warming up in the shower. The recovery was pretty scary. I have never seen anyone that cold before. Gords took his pulse at one point to make sure he was ok. After sitting in the car for a while, Goody asked if the shower was open. We cruised over to where the shower is and I jumped out and got it running and warming up. Gords and I helped Goody into the shower, where he spent quite a while warming up. We could tell he was getting better when he started talking and joking around. He told us about all the struggles he has been going through lately and how much he wanted to do this swim so that he had something positive to think about before starting chemotherapy. He told us about how the last two laps he got MAD and was chanting "F*** YOU CANCER!" to get him through. Cancer picked the wrong dude to mess with! After about an hour and a half, he seemed pretty much back to normal and ok to drive home. I am so glad that I could be there to see his great accomplishment! 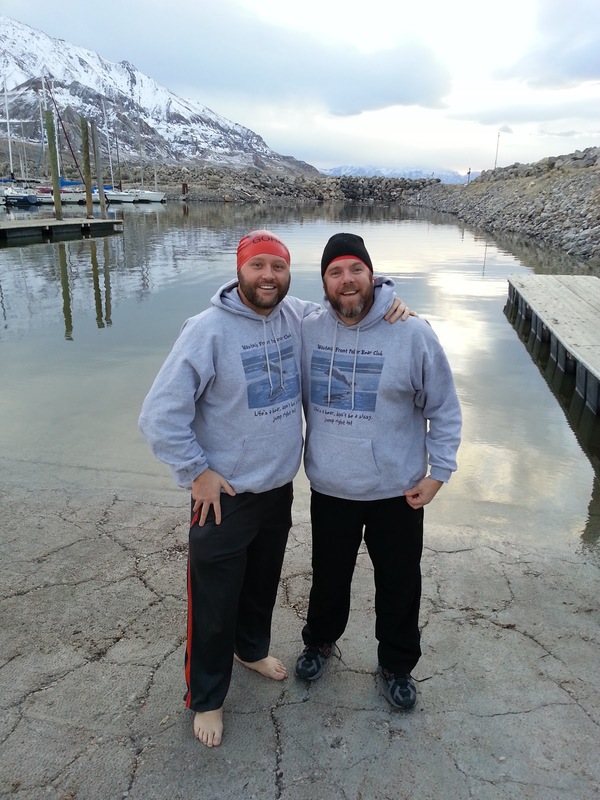 He is the first Utahan to do the Ice Mile and one of only a handfull of people in the country to do it. Goody has been an inspiration to me many times and today was certainly no exception. Way to go Goody!